I am excited to announce that I have accepted a position at the world-class Parque Das Aves in Cataratas Do Iguaçu, Brazil as the Entomology and Communications Postdoc. The park is immersed inside the magical Atlantic Forest, which is currently facing a conservation crisis. As a way to impact and enchant visitors with a deeper appreciation for how organisms are connected, they are building an absolutely massive new aviary centered around Cecropia ecology. What a charismatic focal organism; first of all it's gorgeous, it is the first plant to grow in restored habitat, birds and bats disperse the fruit, sloths eat the leaves, fungi nurture the roots, and my favorite, Azteca ants live in, protect, and nourish it. In addition to continuing research, I will help develop and build beautiful, engaging exhibits based on science, including The Forest of the Glowing Symbionts, macro footage inside observation trees, and a mesmerizing walk-through leafcutter nest. Together, we will create a spectacular, profound, lasting experience like nothing the world has seen that can have real impacts on the restoration of a unique and important ecosystem. I can’t really think up a more exciting job or a better team to work with. Swing by for a visit! Our latest paper was published today in the open access journal Scientific Reports! In "Ant-plant sociometry," we detail the intimately intertwined biology of the ants and their host. But just how intimate is this relationship? Looking at meticulous details revealed the intertwined biology of these partners goes beyond a simple protection mutualism. 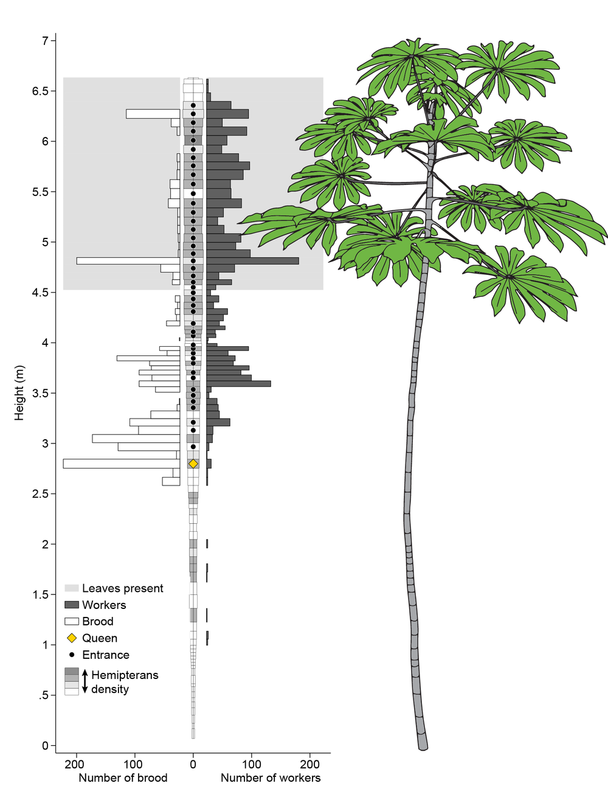 Plant features relate to colony growth, how ants are distributed inside the tree, and the size of the workers. 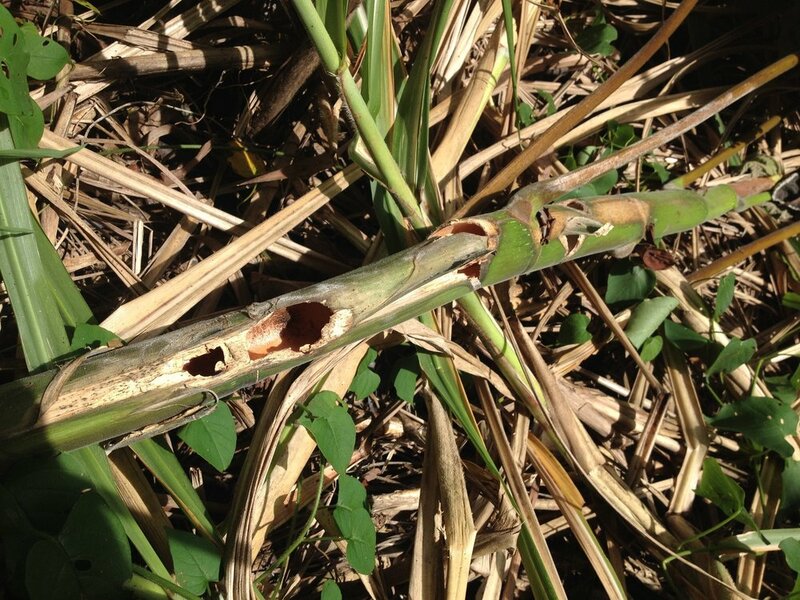 However, colony aggression is not related to the host plant. Discovering the new depths of this relationship helps us understand how these organisms evolved together and why they are so successful today. Read the full text here: https://rdcu.be/bdRCT. Cecropia pachystachya in the forested hills behind the conference. Azteca muelleri biting my thumb. The welcoming crew had a firm handshake. The Congress of the International Union for the Study of Social Insects was held in Guarujá, Brazil in August this year. It was a fantastic conference filled with cutting-edge social insect research, quality scientists, and delicious food. The highlight of the trip was finding a young Cecropia pachystachya tree with a feisty colony of Azteca muelleri while exploring the forested hills behind the conference center. The colony responded to my tree-shaking with a bold welcoming crew, swarming my hand by the dozens. I promptly returned to the conference with an arm full of Azteca and shared the joys of these fascinating biting ants with my fellow ant enthusiasts. The final moment of my dissertation defense. My advisor, Stephen Pratt, and I dress in strange garb for the ancient ritual. I successfully defended my dissertation defense and graduated from ASU. My dissertation “Collective Personality in the Azteca-Cecropia Mutualism” is now available online. Contact me if you would like a copy. 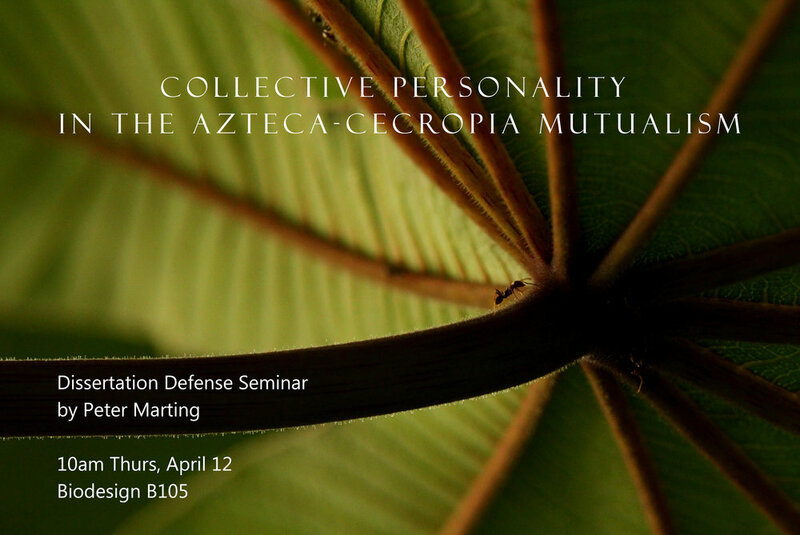 For anyone curious about what I've learned from the Azteca-Cecropia mutualism over the last seven years, I give my public dissertation defense talk next Thursday at 10am. Come check it out! Broadening research impact panel discussion in D.C. Anyone gonna be in DC next week? 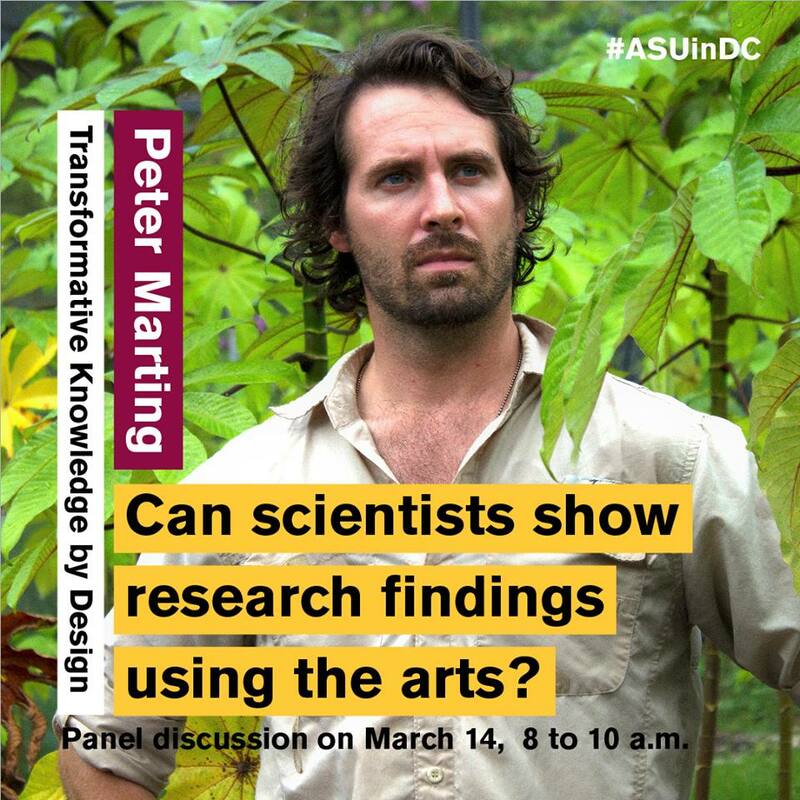 Sign up for a free breakfast and some neat talks about broadening the impact of your research http://bit.ly/registerDC-fb You'll learn about work with ant personalities (Peter Marting (me)), the undead in Gothic literature (Emily Zarka), and brain injuries in veterans (Karen Gallagher). Army ants (Eciton hamatum) connecting together to form scaffolding for their living bivouac. John Hartigan is a professor in the Department of Anthropology at UT Austin. He has written a short reflection on my recent BE article that discuses the merits of using "culture" in place of "collective personality" for colony-level behavioral tendencies. Read the essay here or below. Perhaps choosing preferred terminologies comes down to two main factors: the level of biological organization in focus, and the underlying factors driving behavioral patterns. There is certainly good evidence of non-human animal culture. When I think about what defines animal culture, I imagine certain behaviors, tendencies, or preferences are transmitted socially between individuals and across generations. This may be happening in ant colonies, especially since individual ant behavior can be heavily influenced by social cues from their nestmates. I'm particularly excited about the notion he brings up that culture can be independent of local ecology - that perhaps strong preferences and tendencies arise due to random drift and reinforced by repetition and experience. I can think of some interesting experiments to test for this . . .
Peter R. Marting, William T. Wcislo, and Stephen C. Pratt, “Colony personality and plant health in the Azteca-Cecropiamutualism,” Behavioral Ecology 29, no. 1 (January 2018): 264–71, https://doi.org/10.1093/beheco/arx165. In Defense of Plants is a superb podcast that features all topics botany, and this week's episode is all about the Azteca-Cecropia mutualism. Check it out!